Former NFL football player, WWE General Manager, NBC Sports Broadcaster and American Gladiators co-host. 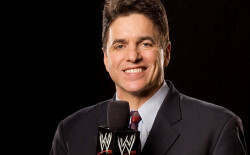 Mike Adamle grew up in Kent, Ohio and graduated from Theodore High School in 1967. His father, Tony Adamle played football in the 1940’s & 1950’s with the Cleveland Browns. Taking a page from his father’s playbook, Adamle went on to play collegiate football for Northwestern University. During his time as a Wildcat, Adamle was team captain, All American fullback and the Big Ten MVP in 1970. Adamle still holds the school record for most rushing yards in a game, 316, against the Wisconsin Badgers, a record set in 1969. After graduating in 1971, Adamle went on to play 6 seasons in the NFL with the Kansas City Chiefs, New York Jets and Chicago Bears. After retiring from playing football professionally, Adamle went on to have a successful broadcasting career. He joined NBC Sports as a radio host and sideline reporter. During his six years with NBC Sports, Adamle also hosted SportsWorld and pre-game shows. Adamle became the co-host of American Gladiators from 1989-1996 and co-hosted International Gladiators with the UK and Australian hosts. In addition to his hosting duties, Adamle was a contender in the celebrity show. Returning to sideline reporting in 2001, Adamle joined KNBC’s Fred Roggin on NBC’s primary XFL broadcast team. He also covered the 2000 and 2004 Summer Olympics. In 2008, Adamle joined the World Wresting Enteretainment (WWE) and WWE RAW as an interviewer. He then went on to be the General Manager for RAW Brand. Adding to Adamle’s extensive resume, he became the play by play announcer for the Chicago Rush Arena Football League and broadcast Rush games for Comcast SportsNet Chicago and WGN. Adamle has completed two Ironman Triathlons, his first in Lake Placid in 2003 and most recently in 2009 at 60 years old. Suffering from epilepsy himself, Adamle is active in the Epilepsy Foundation, where he is currently a member of the Greater Chicago division’s board and was given the Personal Achievement Award at the 2007 Richard N. Rovner Awards Dinner. Early this year, Adamle announced he was diagnosed with dementia and signs of chronic traumatic encephalopathy. It is believed that the past 19 years of epileptic seizures resulted from his concussions in football. Adamle is now actively involved in the Concussion Legacy Foundation and hopes to serve as an example of someone continuing to live their best life despite symptoms of the disease. Mike Adamle was inducted into the National Italian American Sports Hall of Fame in 2017.